ADHD can be a challenging diagnosis to make even for trained physicians, as the ability of people to pay attention or remain calm falls across a broad bell-shaped spectrum. In turn, the majority of patients who land a diagnosis straddle a line where problematic attention and performance merge into variations of normal. It's worth questioning how many people truly need prescription stimulants and that's where unknowns start to overwhelm what we can say for sure is true. For one thing, there is no official count of ADHD cases for people of any age. When it comes to adults, there is much theorizing and speculation among experts. Even if there were a biological metric, someone would have to make an arbitrary decision about where to place the cut-off between normal and not, inevitably defining a large chunk of the population as borderline for ADHD. Numbers of ADHD cases, in other words, are founded in sand. This doesn't mean, as some critics have argued, that ADHD is a figment of our cultural imagination. Rather, despite plenty of efforts among researchers, diagnosis remains a subjective decision in the hands of the psychiatrists, pediatricians, psychologists and other experts who evaluate patients. 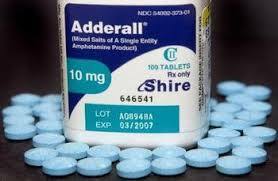 What is clear is that, as ADHD diagnoses have become commonplace, so too has the use of drugs like Adderall. Counting the number of people who have received prescriptions for Adderall (or other prescription stimulants) is far more accurate than trying to figure out how many people have or do not have ADHD. According to the National Survey on Drug Use and Health in 2012 four per cent of all adults used Concerta (or a similar methylphenidate product). Two thirds of those users were in the age group of 18 to 25 years old. Express Scripts, the largest pharmacy-benefits management company in the U.S., found in 2103 that 2.8 per cent of adults ages 26 -34 had had a legal prescription for a stimulant but that wouldn't include adults who had obtained the medication from friends or illegally. Compared to production levels in 1996 (when Running on Ritalin was published), manufacturers in this country now churn out 28 times more amphetamine (the active ingredient in Adderall) and six times more methylphenidate (the active ingredient in Ritalin, a closely related drug), according to DEA data. A total of 194 tons of legal stimulants were produced in the U.S. in 2013, enough to mold into 27 round, blue 20-mg Adderall pills for every man, woman and child living in America today. American manufacturers of legal speed earn an estimated $9 billion a year. And stimulant use has gone mainstream. Hit TV shows, including the Simpsons and Glee, have based entire episodes on the use of stimulants. An episode of the HBO-comedy Silicon Valley featured a whiz-kid teenage computer programmer who ran out of steam when he ran out of Adderall. To the question, "Who takes Adderall anymore?" the high-schooler answered, "Half the kids in Palo Alto." Because of the vague criteria required to meet an ADHD diagnosis, people who want Adderall tend to have little trouble faking the disorder or finding doctors willing to take their word for it. For prospective patients, getting a prescription can be as simple as filling out a form full of predictable questions about their tendency to procrastinate, ability to focus, or feelings about whether they are living up to their full potential. Amenable doctors write prescriptions at rates that far exceed the suspected prevalence of the disorder. In many cases, an office visit is no longer even necessary. The drugs fly around at exam time on every major university and college campus, as well as at many affluent suburban and private high schools. It's no secret at esteemed schools like Wesleyan, where the college newspaper featured a story about an "Adderall fairy" that would hand over pills to anyone who followed clues to find her. The Yale Daily News, the Harvard Crimson, the Daily Princetonian, the Stanford Daily - all have chronicled the growing use of stimulants as study-enhancers on campus. One in six college students admits to misusing stimulants. Among members of fraternities and sororities, rates soar to 80 percent by senior year. An estimated one-third of legal stimulants produced in U.S. ends up in illegal hands, often for highly affordable prices. Students like Amber can sometimes get the drug for free from friends with prescriptions, at least at first. When money changes hands, pills go for as little as five dollars a pop. Not every adult who takes Adderall gets addicted, though it's hard to know exactly how often use goes awry. The one and perhaps only study to try to quantify the link found that one in 10 people who obtained the drug without a prescription described their use as consistent with the abuse and addiction. The study was funded by Eli Lilly and Company, which makes Strattera, a competing, non-stimulant medication for ADHD, and would have an obvious interest in highlighting problems with Adderall. While government officials subsequently vetted the study's data, the number still seems a bit high. But even if half that number becomes addicted, just one out of every 20 of the millions of people who illegally use Adderall, that still adds up to a whole lot of people like Amber - dependent, despondent, trapped. "I have had some dark times on this stuff," Amber says. "Laying in my bed coming down every night, crying to myself, feeling more alone then ever. Pushing people away in my life. Severe depression. The list goes on. Never in my life would I have thought that I'd become addicted to this awful stuff, let alone any kind of drug. I've never been that kind of person - until now."